When Eden by Lipstick Queen appeared at Barneys several weeks ago as a new item it sounded vaguely familiar. And, indeed, a quick search revealed that creator Poppy King had used the name previously for one of her "Saints" lipstick (I've always been more of a Sinner). 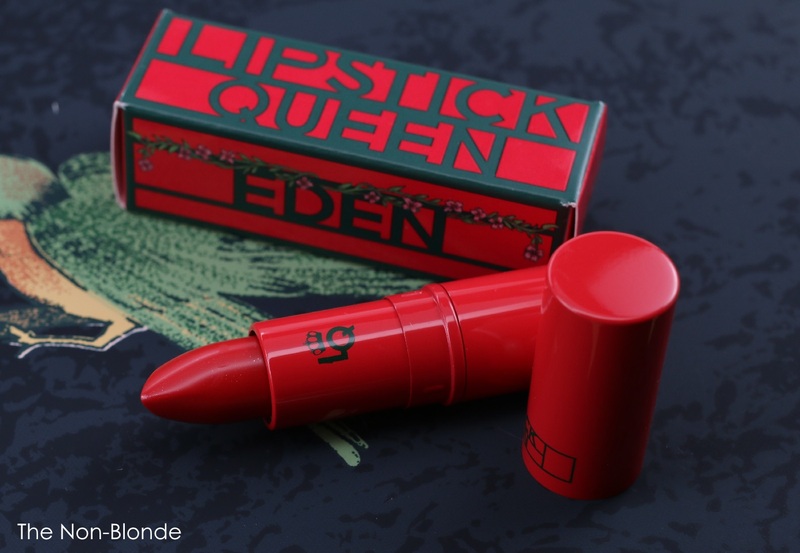 The new Eden comes in a different tube (red rather than gold), and is not as sheer as the Saint lipsticks. 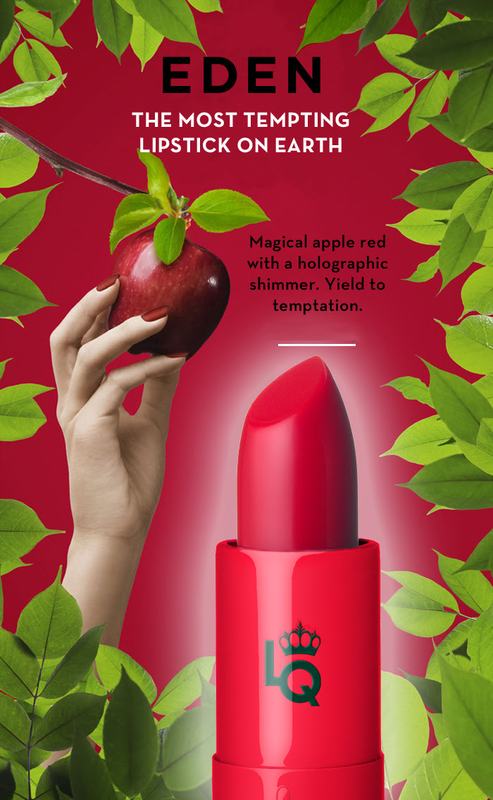 Eden is an exuberant apple red with what Lipstick Queen calls a "holographic shimmer", that's actually rather subtle on the lips and add life and fullness. I find it cheerful and a great pick-me-up color, especially on days one looks in the mirror asking "...and I got up for this?". Even the newsletter looked tempting. 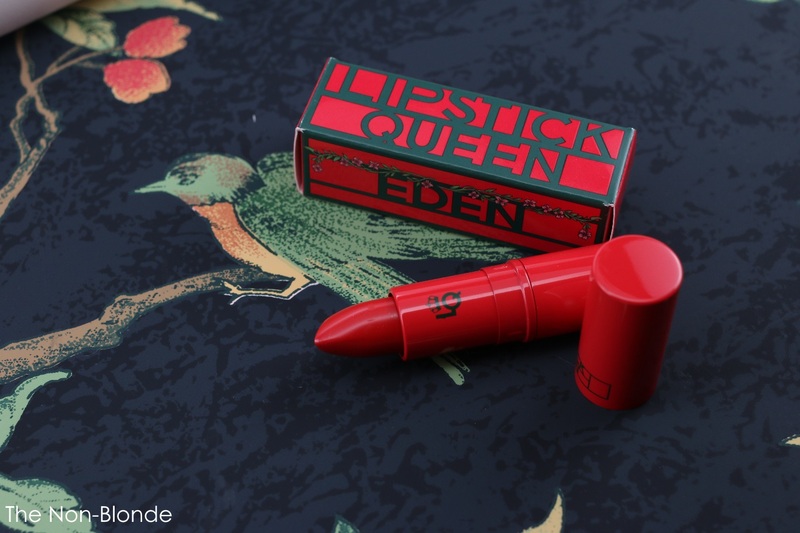 The formula is one of Lipstick Queen's better ones. It's rich with nourishing butters and does not contain fragrance or other infamous irritants. Longevity is medium (tea=yes, though some transferring might occur, burger=no), and since the color is intense and bright there is some stain left behind. Eden is luxurious and pampering, and it's one of those not so guilty pleasures. 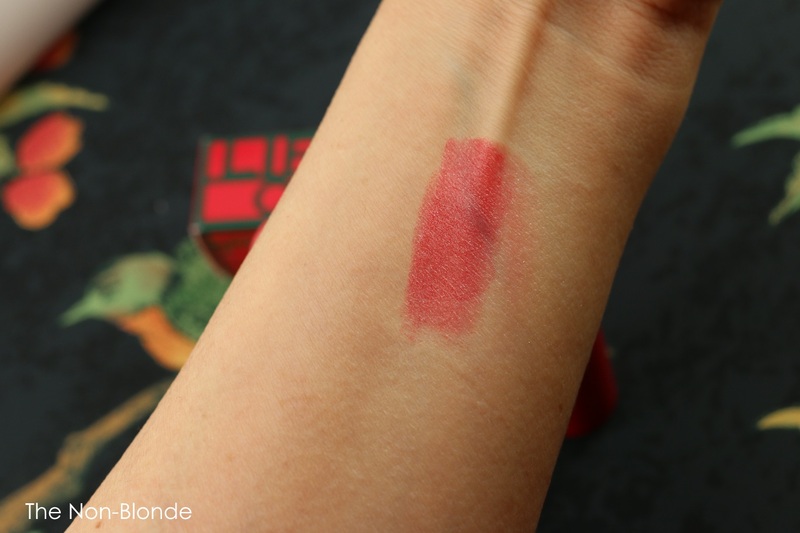 It's good basic red that feels like a high-end balm yet gives an intense color. The shimmer doesn't translate into visible particles at all. Instead, it gives a shine (obviously) and a plump dimensional appearance. Bottom Line: Very flattering, and a good starter red. Ingredients: Castor Seed Oil, Caprylic/Capric Triglyceride, Vegetable Oil, Candelilla Wax, Beeswax, Ozokerite, Shea Butter, Calcium Sodium Borosilicate, Hydrogenated Olive Oil, Mango Seed Butter, Phenoxyethanol, Tocopheryl Acetate, Hydrogenated Vegetable Oil, Limnanthes Meadowfoam Seed Oil, Sunflower Seed Oil, , Red 30 Lake (CI 73360), Titanium Dioxide (CI 77891), Carmine (CI 75470), Red 6 (CI 15850), Red 28 lake (CI 45410). Lipstick Queen- Eden ($24, made in Canada) is available from Barneys. This looks lovely yet slightly sheer for my taste. That does look like an easy to wear casual red. I love how creamy her lipsticks are, the saint series is perfect for work/daytime when you want just enough 'pop'.